How often have you felt suddenly ravenous and reached for the nearest unhealthy snack? The biscuit barrel or a bag of salty crisps, perhaps? The satisfaction is often short lived and the sugar rush turns into a massive sugar slump and so you repeat the unhealthy cycle over and over again. 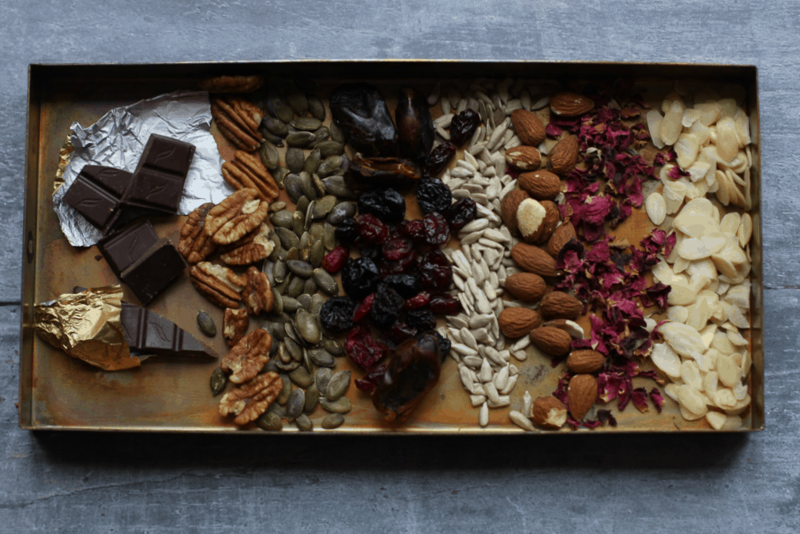 Homemade fruit and nut dark chocolate thins are perfect for keeping stashed away so that you can have your afternoon treat without the guilt! 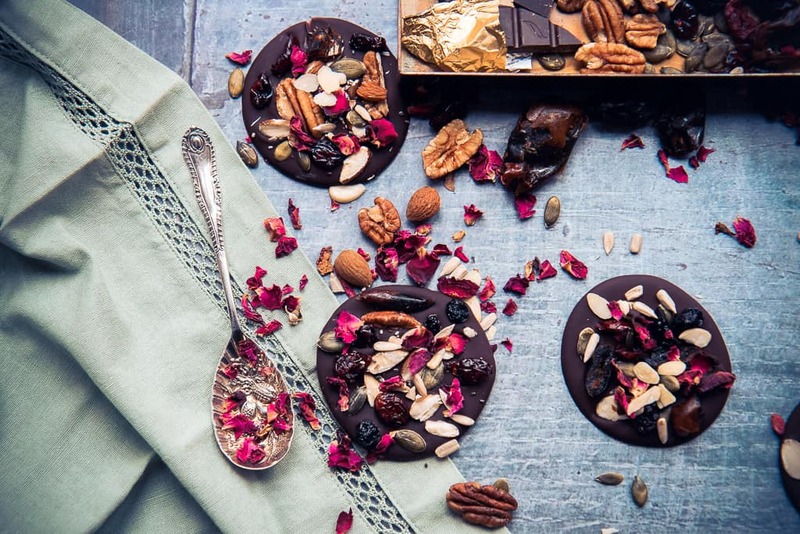 Dark chocolate is absolutely packed full of antioxidants and rich in minerals such as potassium, zinc and selenium and when eaten in moderation has many other health benefits. Because it’s so rich you don’t need much to get that ‘chocolate hit’ and satisfy your craving for something sweet and delicious. 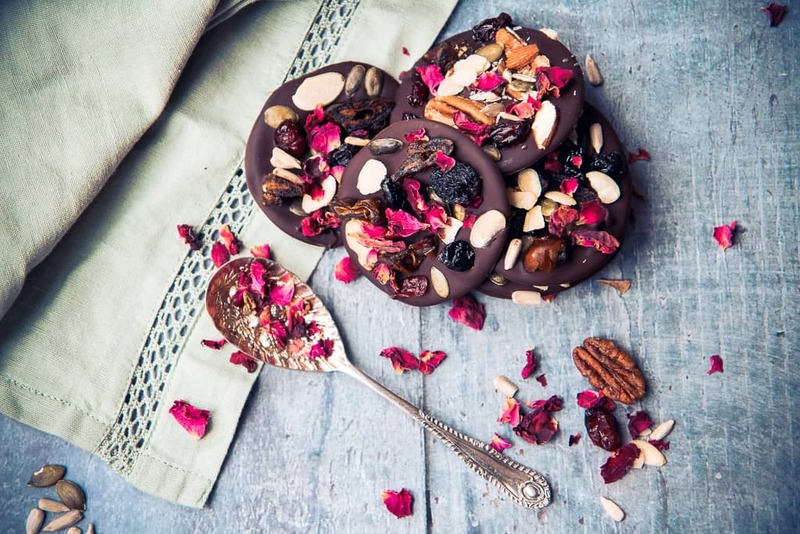 These chocolate thins take minutes to make and you can add whatever healthy toppings you fancy. I used whole almonds and pecans because that’s what I had in my cupboard but brazil or hazelnuts would work just as well. Pop on any dried fruit and seeds you have – you could even sprinkle a bit of flaxseed over the top if you’re feeling extra healthy. I added a few dried rose petals to my fruit and nut thins which are completely edible and kind of reminded me of turkish delight but without the ‘squidge’. 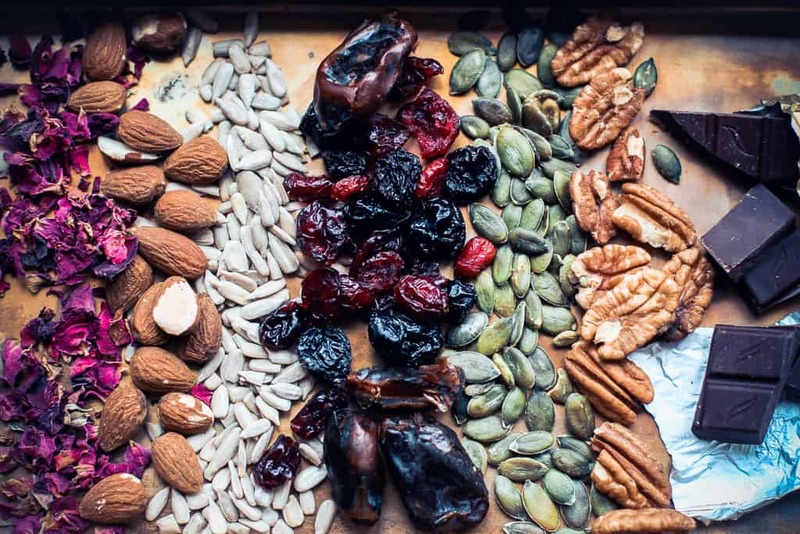 assorted dried fruits, nuts and seeds. I used cranberries, blackcurrants, figs, raisins, pecans, almonds, pumpkin and sunflower seeds and dried edible rose petals to decorate. Melt dark chocolate in the microwave, stirring at 30-second intervals. Take a sheet of baking parchment and spoon the melted chocolate into circles. A good rule of thumb is about one tablespoon full of melted chocolate per thin. Add your choice of toppings before the chocolate sets. Once set, wrap in baking paper and enjoy as a healthy treat. 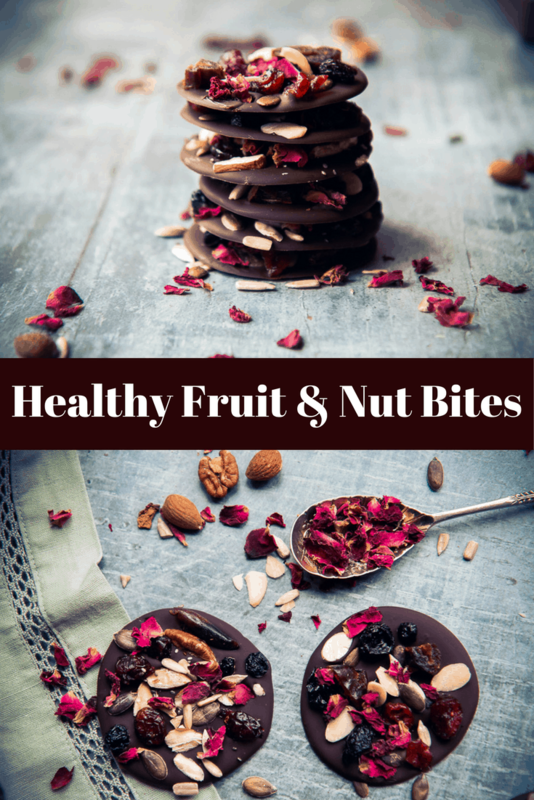 These are definitely a healthy version of the family favourite fruit and nut bar and you really shouldn’t feel guilty eating something packed full of antioxidants and detoxing fruits, nuts, and seeds. The perfect pick me up, enjoy! Oh my, these look too delicious to be healthy too. I HAVE to make some. They really are delicious, I hope you make them! These look amazing! A perfect ‘feels really naughty’ but is actually healthy treat! Yum, it’s like a healthier, classier version of chocolate bark. They look delicious. Stunning photographs Amy!!! 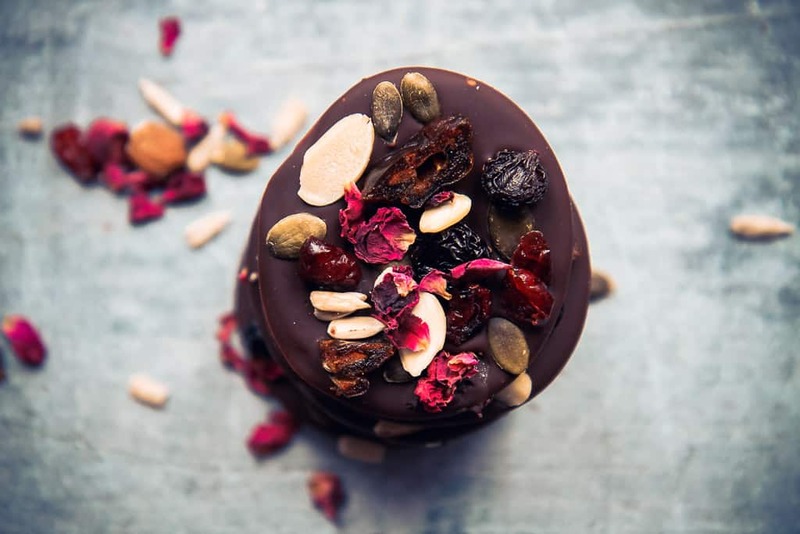 Just divine, and anything with dark chocolate has won me over! Can’t wait to share this with Aspen! 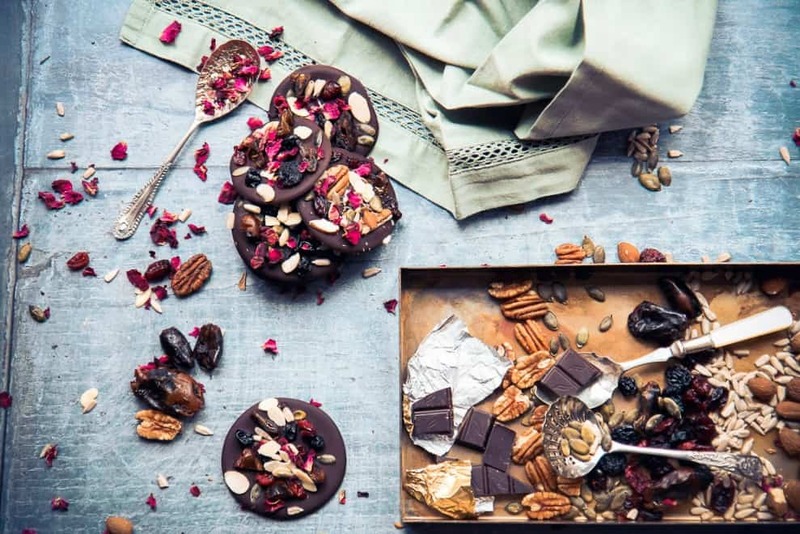 Yum – these look delicious and the colours of the dried fruit and nuts make them look so inviting. Beautiful food photography too.